Field service management (FSM) entails scheduling, optimizing, and dispatching teams of technicians into the field to manage service and repairs of systems or equipment. Optimizing FSM is challenging as it involves prioritizing, scheduling, and dispatching technicians to different locations, while minimizing cost and maintaining high customer service levels. Energy and utilities firms face many challenges that ultimately dictate the creation and implementation of an effective FSM program, including customer demand and high expectations, the rising cost of fuel, vehicle maintenance costs, carrying inventory, pressure to bolster service-related revenue, missing analytical and service data, and a lack of real-time communication. Some energy and utilities firms have started using mobility to improve communication with the field, increase productivity, streamline work processes, and enhance customer service and loyalty. Mobility simplifies many field service processes, like data collection, with features, such as barcode scanners, SCADA sensors, utility line sensors, RFID, and GPS. Modern energy and utilities firms also need targeted alerts enriched with analytics over the data. For instance, being able to combine real-time weather information with the location of known assets (such as transmission lines, power stations, transformers, trucks, and field service personnel) and send targeted alerts and notifications based on real-time correlation of data using geospatial intelligence. 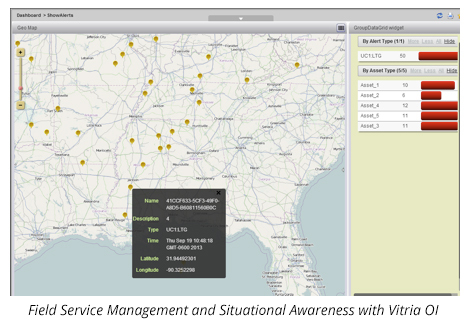 Vitria OI offers energy and utility operators a solution for scheduling, dispatching, and managing inventory, in real-time. It helps energy and utilities firms optimally plan and dispatch field service technicians and their properly stocked vehicles to a customer’s location in a timely manner in order to deliver against their service-level agreements (SLAs).